Brunch means different things to different people—for some it is the only time it is acceptable to eat an egg on top of absolutely anything, for others it’s an opportunity to find out how bottomless a mimosa can really be. But for Bea Crespo and Andrea Portoles it is a medium for art. 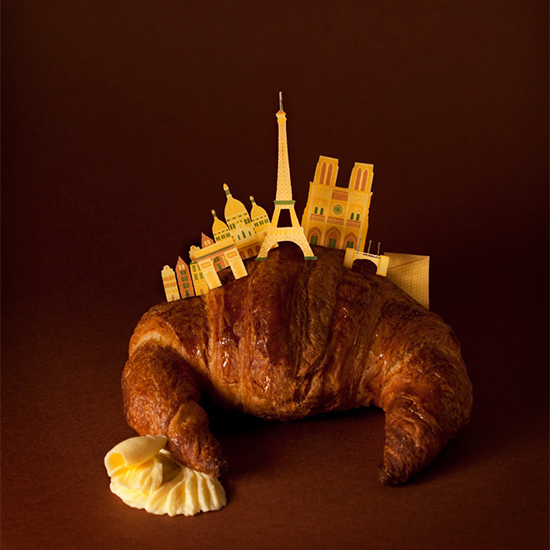 Brunch City is Crespo and Portoles’ ongoing project in which they recreate tiny cities atop some of those cities' iconic foods. It is your 8th grade diorama taken to wonderfully intricate and much tastier levels. Gaudi’s Sagrada Familia sits atop a piece of Catalan tomato bread. The Roman Coliseum is woven into a scoop of gelato and the Grand Palace of Brussels is tucked into the pocket of a crisp Belgian Waffle. Obviously. Food is a comfortable canvas for Portoles whose other works include a perfect sandwich sewn together so nothing falls out and Pan con Pan in which she makes the entire exhibit out of bread, but her collaboration with Crespo is her longest running culinary project stretching back to 2013. The two haven’t done San Francisco yet, but we would like to see the Golden Gate Bridge sitting on the symbol of brunch in the bay area—a 3-hour-long line.